I didn't mean to win this card. I put in a low bid early and no one outbid me. 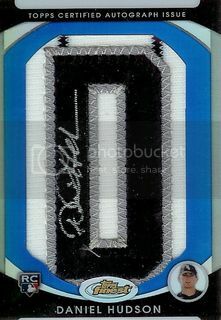 It's a blue parallel of Daniel Hudson's 2010 Topps Finest Letterman autograph. Don't get me wrong, I like it. Plus it was super cheap especially for a card numbered to 25. I'm just not planning on picking up the other five. I picked up the regular and blue versions of Daniel Hudson's 2012 Bowman Platinum card right when they came out. This gold patch version eluded me for quite some time. I finally got this one for a great price. The patch isn't the prettiest girl at the bar but it will do. It's nice and shiny and numbered to 50 on the lower right corner. I knocked out a bunch of Luis Aparicio stuff that I had scanned for awhile but hadn't posted. Now it's Daniel Hudson's turn. 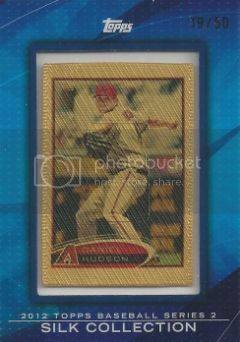 I got this 2012 Topps Silk Collection DHuddy card for $5 shipped. I picked up a few of the 2008 Topps Silk cards a few years ago but haven't gotten any since. I still like these. They're different and being numbered to 50 doesn't hurt either. Happy Memorial Day, everybody! I've got tickets to tonight's Diamondbacks game so it should be a good day. Hopefully the D-Backs can get a few runs off Yu Darvish and get the win. 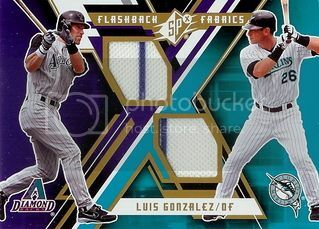 I won this 2009 UD SPX Flashback Fabrics card of Luis Gonzalez off eBay for a few bucks. It recognizes his move from Arizona to Florida during the 2008 season. There are two nice jersey pieces. The purple pinstripes are a dead giveaway that they are both from a D-Backs jersey. It would be a little cooler if each team was represented but that's okay. I still like it. I was going through some of my Dad's stuff the other day and I found a few vintage Luis Aparicio cards. This is the eighth and final card I have to post for now. 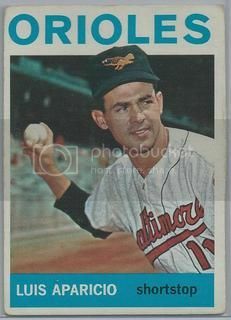 It also happens to be the final card from Luis Aparicio's playing days. 1973 was the final season for Lil Luis. I was looking over his salary information on Baseball Reference. Over his 18 year career, he only made 665,000. Almost a third of that was during his final two seasons. It's crazy how much salaries changed over the next twenty years. I was going through some of my Dad's stuff the other day and I found a few vintage Luis Aparicio cards. This is the second to last card from that stack. 1964 Topps? Looks more like 2013 Topps Heritage to me. 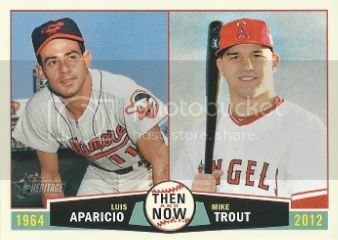 This is one of the better pictures Topps chose for Aparicio. It's another nice posed shot but you can see a little more of his body on this one. The previous years almost all featured head-shots. 1964 would be the last year Lil Luis would lead the league in stolen bases. It was his ninth consecutive year of swiping more bags than any other American League player. He also won another Gold Glove and was an All-Star. I was going through some of my Dad's stuff the other day and I found a few vintage Luis Aparicio cards. I'll post each of them over the next few days. 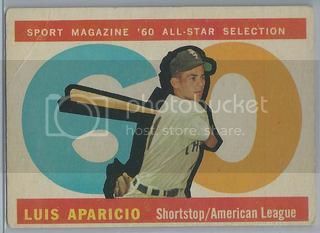 I like the 1962 Topps All-Star design but the picture on this Aparicio card is a little boring. Most of the other cards in the set are better. 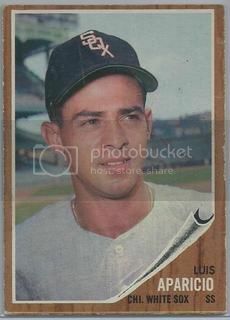 I mentioned yesterday that Lil Luis was named to the All-Star team in 1962 for the fifth straight year. He would go on to make five more All-Star teams before retiring after the 1973 season. Ah 1962 Topps. The original "woody" design. It's a classic which was reinvented in 1987. 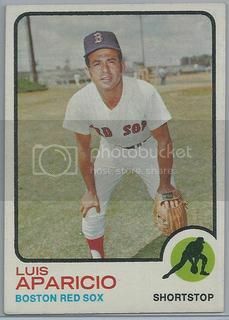 In 1962 Lil Luis won his fifth consecutive Gold Glove award, was named to his fifth consecutive All-Star team, and led the league in stolen bases for the seventh time in his career. It would also be his last year in Chicago for awhile. It's kind of funny to me that a lot of these old sets like 1961 Topps don't feel that old thanks to Topps Heritage. 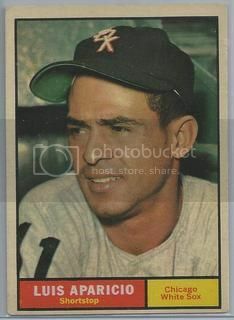 The 2010 Topps Heritage set included an autographed reprint of this original Luis Aparicio card. 1961 was another solid year for Lil Luis. He was named to another All-Star team, he won another Gold Glove award, and he led the AL in stolen bases. He also finished twelfth in the AL MVP voting. Yesterday I mentioned that the 1958 Topps design is my favorite base design. The 1960 All-Star set features my favorite All-Star design. In 1960, Lil Luis made his second All-Star team. He also won his second Gold Glove award and led the AL in stolen bases for the fifth straight year. My favorite is this one from the 1958 Topps set. 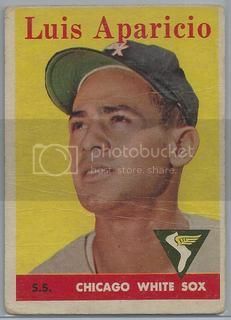 I guess it's not much of a surprise since 58 is probably my favorite all-time Topps design. 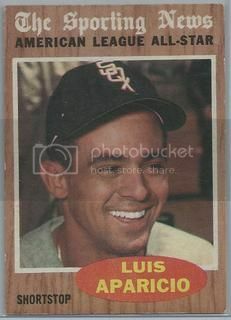 1958 was Lil Luis's third big league season. He led the league in stolen bases. He was an All-Star for the first time and won his first Gold Glove award. Tony Gwynn Jr signed his 2008 Topps Black Border Parallel card for our 08 Topps collection at a Spring Training practice back in February. He is currently playing for the Dodgers Triple A team in Albuquerque. I like the black border parallel cards even though I don't have too many of them. This one is numbered 19/57 on the back. 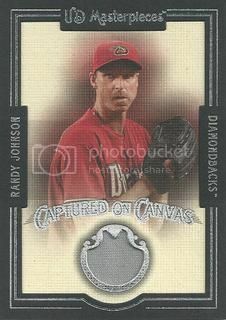 I picked up this Randy Johnson jersey card from the 2007 Upper Deck Masterpieces set awhile back. It's a nice simple design with an average sized grey swatch. Last week was the anniversary of the game where Randy had 20 strikeouts in a game. I remember attendance on the days he pitched at home were always higher than the surrounding days. Dude was an event. 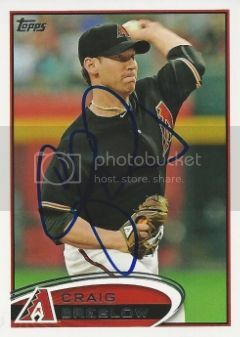 Craig Breslow signed his 2012 Topps Update card for us from a TTM request during Spring Training. Craig pitched in 40 games for the Diamondbacks in 2012 before being traded to Boston at the trade deadline. I've got a bunch of stuff scanned for awhile that I haven't gotten a chance to post yet. I'll try to start knocking some of it out. 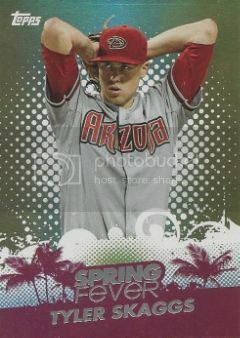 First up is this Tyler Skaggs 2013 Topps card from the Spring Fever redemption set. I really like these. They're nice and shiny. I grabbed two copies of this one for less than a buck. Tyler is in Triple A right now and isn't making much of a case to get called up. His era is well over 6 but he does have 32 strikeouts in 31 innings. 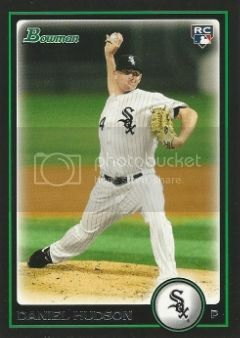 I won a lot of 40 Daniel Hudson cards on eBay the other day. It had only had five different cards so there were tons of duplicates. I didn't have this 2010 Bowman card yet so it makes it's way into the player collection. Luis Aparicio always seems to be included in these Topps Heritage Then & Now sets since he led the league in stolen bases so many times. This one features Lil Luis and mega-prospect Mike Trout. Aparicio's career high in stolen bases was 57. Trout had 49 last year. 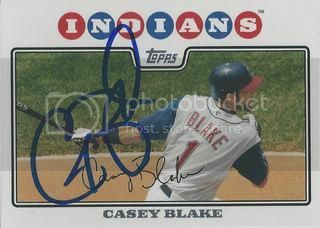 Former Indians infielder, Casey Blake, signed a card for our set. He had a few good years in Cleveland. His best was in 2004 when he hit 28 home runs and drove in 88 runs. 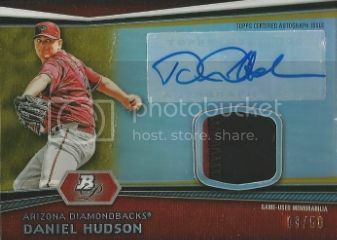 I won a lot of 40 Daniel Hudson cards on eBay the other day. It had only had five different cards so there were tons of duplicates. I didn't have this 2009 Bowman Chrome card yet so it makes it's way into the player collection.